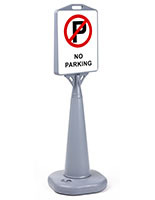 This outdoor cone sign, also called a parking lot poster stand, is an affordable and effective way of communicating with a target audience outdoors. 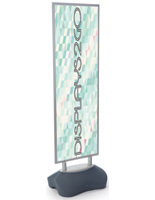 The plastic street display is ideally suited for event parking. 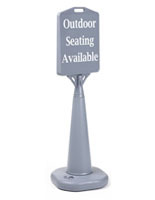 The outdoor cone sign that is durable will not be damaged by wind or rain. 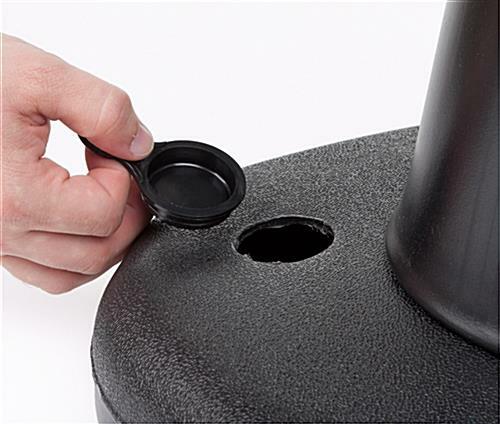 The plastic holder is lightweight for easy transportation. 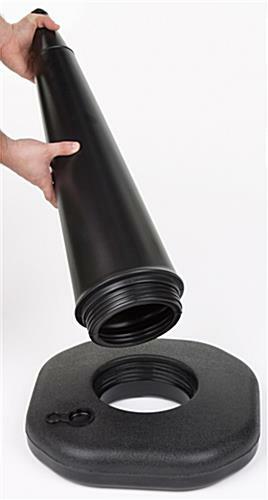 Each outdoor cone sign that can be used indoors too can simply be carried inside via the molded in handle! 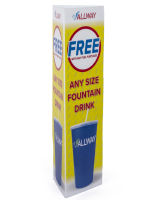 The plastic street poster holder will help generate more foot traffic for any business utilizing this tool! 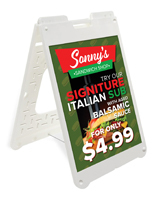 The outdoor cone sign is economical, making this a smart way to gather more customers. Graphics can be taped or glued onto the black plastic display. The outdoor cone sign has a signage area measuring 13"w by 15"h. The plastic street sign is double-sided allowing for maximum visibility by possible customers. 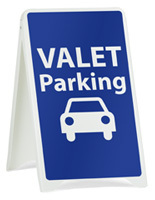 Each outdoor cone sign is constructed from durable polyethylene, which prevents the unit from rusting and splintering. Furthermore, the black color is neutral for use in any type of indoor or outdoor setting. Each outdoor cone sign has a base that can be weighted down with either water or sand. This gives the owner more flexibility, allowing the plastic street poster holder to be left outside in the wind. The outdoor cone sign that is unassembled takes just mere minutes to put together. Absolutely no tools are required to assemble your plastic street display! At a height 47" tall, this plastic street display is a sure way to be seen by almost everyone who passes by it! Vinyl graphics are not included with this unit! 14.5" x 47.0" x 14.5"
Great sign - need to put sand or water in base to make it sturdy. Easily MOVABLE in case your needs change. These are great - I work at a retirement community and we use them to indicate that a "reserved" resident parking space is temporarily available for visitors to park in. I find filling them with water to be problematic - seems like there is always a small leak somewhere, and this makes it messy to move and handle the stands. Plus the water evaporates which means they need to be refilled somewhat regularly. I fill our stands up with sand instead, and it seems to be a better solution. Thanks for the excellent review, Kendra! We're glad that these sign stands were a viable solution for adding temporary visitor spaces to your retirement community's parking lot. 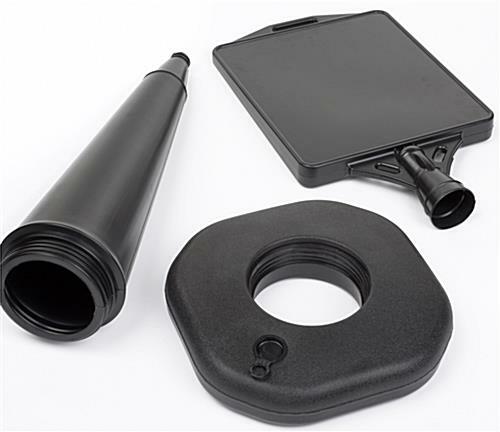 Filling the base with water or sand works great to provide longstanding durability - and we're glad that a sand-fill worked well for your needs. Thanks for the recommendation! Sign stand is super easy to set up and looks great. All you need is a 25lb bag of sand or water to weight it down. I bought these to use for temporary outdoor signage (buses only, parking lot full, enter here) and they are working well so far. They were easy to put together, but they're very light, so you definitely need to put water in the bases. They don't have anything like slots or plexi that hold a sign on the front, just a flat surface. Right now we are laminating and taping paper signs to the front. Once we figure out which signs we use the most and which wording we like the best, we'll have our signs printed on a more durable, waterproof material and probably use industrial strength velcro to attach them and also be able to swap them out when needed. For being fairly inexpensive and made of plastic, they actually look pretty good, which was a nice surprise. 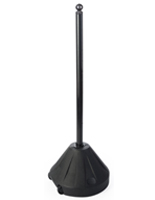 The sign stand traffic cones are very light weight and easy to put together. Our event that we need the signs for has not taken place yet so I will not be able to include a picture. We anticipate they will work very well for our event. We're glad you're satisfied with your purchase so far, Patricia! Please don't hesitate to reach out to us via phone, email, or chat if we can be of any assistance.